Hello my friends! I'm really excited to share the recipe for this extremely tasty Brazilian Bean Stew with you because it's super delicious, full of healthy stuff and very inspired by my recent trip to Brazil. If you were following along on my Instagram stories, then you would have seen that Matt & I traveled to Recife, Brazil this month to attend our friends' wedding. We spent the first week relaxing at this amazing property right on the beach in Praia dos Carneiros and attending a seriously beautiful beachside wedding. It was a bit of a reunion with some of our Aussie friends, so as I'm sure you can imagine lots of delicious food was eaten, cold beers were drank and tons of laughs were had. This is me, standing outside of our home for the week (our bedroom was the top window open wide), looking pretty nerdy but sun-safe! THE FOOD! Although Brazilian cooking is fairly meat-based (and I don't really cook meat very often at home), I did gain today's recipe inspiration from the delicious home-cooked bean stew in the picture above. I was told that different regions in Brazil tend to cook with a specific bean, our region using the Fava bean. If you can't get your hands on Fava beans for this recipe, black beans will also do the trick. From what we experienced, the Brazilians tend to have a fairly large breakfast, a hearty lunch and then a smaller dinner. I think this is a really nice way to eat our meals, allowing the body more time to digest food while we're active during the days. When we eat a large meal in the evenings our body has to do all the tough work digesting, absorbing and assimilating all of that food at night. During sleep, our bodies get the chance to repair and regenerate cells, helping us stay healthy & fresh. So you'll get a lot more value out of that time if your body isn't also working hard digesting your big dinner! 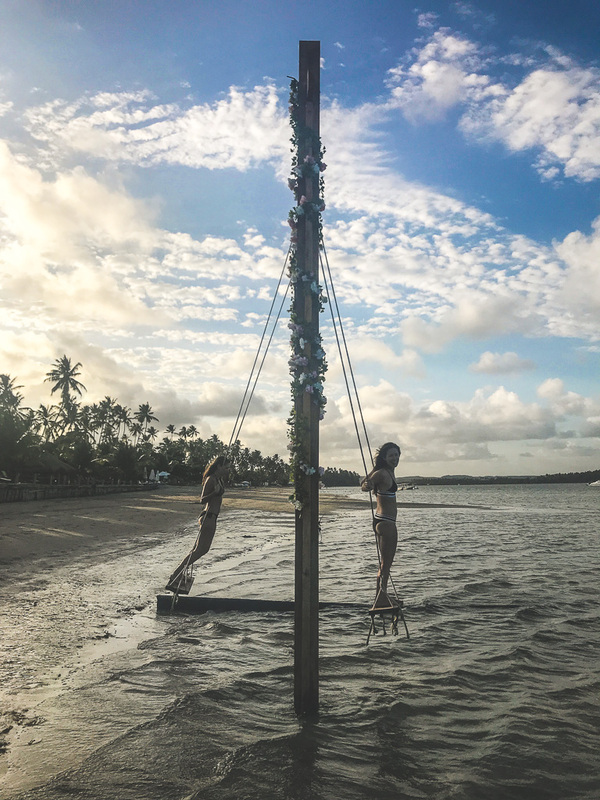 And just as we were all settling into relaxing beach mode, we packed everything up and headed to Olinda for a crazy few nights at Carnaval! Stay tuned for a travel guide blog post with all the details from the incredible, colourful, sweaty experience of sipping caipirinhas, while we're covered in mud and partying it up in jam-packed streets! A flavourful, hearty vegetarian stew packed with fava beans for protein and colourful veggies for all the vitamins, minerals and antioxidants to keep you healthy. A big scoop of zesty salsa on top packs an extra nutritious punch with tons of flavour. Cook this one on a cold winter's day to take you somewhere warm & tropical. Preheat oven to 200 C | 400 F.
Peel sweet potato & chop into cubes, roughly chop bell peppers. Place on a lined baking sheet, drizzle on 1 tbsp olive oil and sprinkle with salt and pepper. Place in the oven for 35 minutes, flipping over halfway through. Peel and dice red onion & mince garlic. Place in a large soup pot on medium heat with 1 tbsp olive oil. Sauté for 7 minutes until onions are slightly browned and then add paprika, thyme and cayenne pepper and sauté for 1 minute more. Add water & bayleaf, bring to a boil and then simmer covered for 15 minutes. When veggies are finished roasting, remove from oven and put aside. Meanwhile prepare the salsa. Peel & dice the orange, dice the tomato and chop coriander. Combine in a mixing bowl, squeeze on the lime and add sliced jalapeño to your liking. Add canned fava beans, juices and all, into the soup pot and return to a simmer. Slice kale leaves from the hard stem and then roughly chop the leaves. Add roasted veggies & chopped kale to the soup pot and simmer for 2 minutes. Season bean stew with salt and pepper. Serve stew topped with greek yogurt and salsa. Enjoy! Tip: To make it vegan, skip the greek yogurt or replace with coconut yogurt. The Harsh Truth: How Much Sugar is in Your Breakfast? Sign up to keep update with nutrition advice, life insights and delicious recipes. Thank you! Check your email to confirm subscription.